Dr. Frank Brettschneider, a privately practicing otolaryngologist and oro-facial plastic surgeon, welcomes a diverse range of patients with hearing loss. Dr. Frank Brettschneider builds on extensive experience in performing hearing screenings for newborn babies. Hearing loss in children may be either a congenital or acquired condition. Congenital hearing loss, often diagnosed at birth, develops as a result of heredity or from problems in pregnancy or delivery. Premature birth may also put a baby at risk of congenital hearing loss, as can a neurologic disorder. However, some infants do develop hearing loss during the first months or years of life. Hearing loss in these children may be a secondary condition to an infection, such as meningitis or influenza. Children may also lose hearing following a head injury, after exposure to extremely loud noise, or as a reaction to a particular medication. Parents are often the first to notice hearing loss in such cases. Many parents begin to suspect hearing loss when they realize that their babies no longer jump or startle at a loud noise. They may notice that the baby is not responding to music or soothing voices, or that the child does not appear to be producing sound as expected. Most babies begin to coo by 2 months of age and babble by 4 to 8 months of age, and failure to do so may be a sign of hearing loss. This is particularly likely if the child does not turn toward an unseen sound, respond to changes in tone of voice, or enjoy playing with noisemaking toys. Development in hearing and speech involves a variety of processes, and only a physician can assess whether a child’s delays stem from hearing problems or other issues. 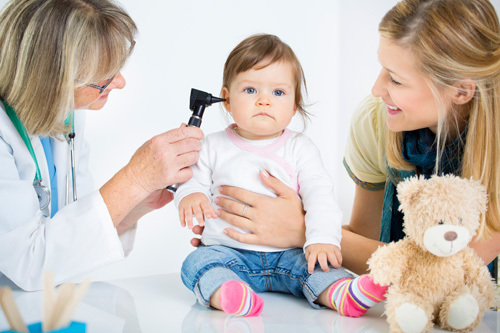 Parents should discuss any concerns they might have with the child’s pediatrician or a specialist. Dr. Frank Brettschneider currently serves as the President of Port Huron Ear, Nose, and Throat (E.N.T.). Prior to establishing the successful private practice in 1990, Dr. Frank Brettschneider garnered more than 20 years of education and experience across the fields of oro-facial plastic surgery and general otolaryngology. In 1985, Dr. Frank Brettschneider earned a Doctor of Osteopathic Medicine from Michigan State University. Founded in 1855 as the Agricultural College of the State of Michigan, Michigan State University (MSU) officially adopted its current moniker in 1964. Located in East Lansing, Michigan, MSU remains the United States’ inaugural land-grant university. Following the 1862 Morrill Act, what is now Michigan State University hosted the country’s initial foray into democratizing advanced education. Consequently, MSU has acted as the model for our modern public university system, leading the way for 69 subsequent land-grant schools. More than 150 years later, Michigan State University continues to sustain a strong tradition of excellence, innovation, and leadership. Michigan State University presently offers approximately 200 undergraduate and advanced programs through 17 degree-granting colleges. The pioneering public institution also boasts greater than 260 study abroad programs in more than 60 countries across all inhabited continents. Ranked first among U.S. public universities for its study abroad participation, Michigan State University’s total international student enrollment remains eighth across all US universities. Michigan State University also maintains a 25-year record as the foremost producer of Rhodes Scholars among all Big Ten schools. In addition to retaining its longstanding position as an educational trailblazer, Michigan State University continues to act as a leader in innovative research. In the 2009-10 academic year alone, total MSU grants reached approximately $495 million. The National Wildlife Federation’s Campus Environment Report Card designated Michigan State University as among the country’s five most-sustainable campuses. Additionally, U.S. News & World Report ranks MSU as first for its graduate programs in nuclear physics, rehabilitation counseling, industrial and organizational psychology, and elementary and secondary education. According to the noted national publication, Michigan State University ranks 29th among all public universities nationwide. The annual Shanghai Jiao Tong University Academic Ranking of World Universities has honored MSU among its 100 top-rated international universities for eight straight years, and Kiplinger’s 2009–10 Best Values in Public Colleges ranked Michigan State University as first among all Big Ten schools. Michigan State University also remains the only university in the United States boasting three on-campus medical schools. For more information regarding Michigan State University, please visit http://www.msu.edu.